The return from San Diego in March-April 1914 was a turning point in Burroughs' life. In a sense it was a childhood's end. The past was now the past. ERB's future lay ahead. The fact that he had won the gamble of the stay in San Diego being able to spend recklessly and still have his back financially covered must have been a tonic to his self-confidence. He was able to do nearly anything he wanted to do. One was to begin his library. 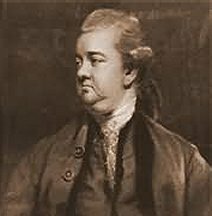 A key book in his library was Edward Gibbon’s Decline And Fall Of The Roman Empire. He recorded its purchase date in 1913 and the day he completed the work just after his birthday in 1915. One imagines that by the time he wrote his three sequels in mid-1914 he had read a few of the volumes of his twelve volume set. 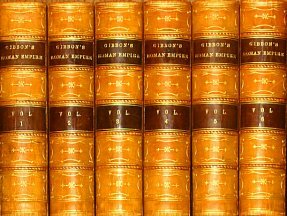 This is important because reading Gibbon is a life-changing event. In the language of the sixties the history is consciousness expanding. In a sense it is a transition from childhood to maturity. It is impossible to stress suficiently the changes that ERB is going through or the rapidity of the changes. Already just returned from San Diego he is purchasing a new automobile, a Hudson. It is perhaps no coincidence that The Mad King opens with Barney Custer/ERB careening down the road in a new Roadster. That it is gray is of very little significance because the only colors available in 1914 were probably grey and black. Or perhaps as the Hudson appears to be grey in black and white photos Barney's car for that reason was grey. One can only imagine the exhilaration ERB experienced as he climbed behind the wheel of big new touring car. It was Hudson, not a cheap Ford. Nineteen fourteen was also a turning point in the history of Ford Motors. ERB always disparages Fords in these years, proud that he's driving a more expensive automobile. The woes of not being able to afford a car from 1903 on must have melted away. Not only did ERB buy a new car but he and his family of wife and three children moved into luxurious new quarters in the affluent Chicago suburb of Oak Park. So ERB began a new life on his return to Chicago. Shortly after his return Tarzan Of The Apes was released in book form by A.C. McClurg. Magazine and newspaper response to his stories had been terrific so there was no reason for Burroughs not to anticipate large sales. One can imagine him sitting up nights calculating the number. A hundred thousand? Too low. A million? Well, if he got really lucky. We’ve all enjoyed the anticipation of some sort along those lines. The book was released in May, 1914 but there is no indication that McClurg’s even sold through the fifteen thousand of the contract or, indeed, that they even ever printed that many. The title was turned over to the reprint house of A.L. Burt early the next year in 1915. Burt was so uncertain of the books reception that they made McClurgs guarantee the first printing. When Burt turned the title over to Grossett and Dunlap they claimed to have sold less than seven hundred thousand copies at fifty cents each. Royalties were only four and a half cents a copy of which McClurg’s got half so Burroughs realized a mere pittance. He was thrown back almost wholly on his magazine revenues. He began to receive some money from newspaper syndication but this was relatively a pittance given his expectations. Within a few years movie money would begin coming in but for the time being Burroughs had to keep writing because as usual he was spending in advance of receipts. I believe one can detect a change in the style of his writing at this point. Whereas prior to the return from San Diego with the energy of the bloom of Spring relying perhaps on stories that had evolved in his mind as he daydreamed in the lean years stories just flowed from his pen. It seems likely that he exhausted that reservoir in San Diego so that now he had actually to work at dreaming up stories. In all three of the titles the sequels are significantly longer than the first halves while changing from personal revelations more toward formal stories. The editorship of Munsey’s had also changed from Metcalf to Bob Davis - Robert H. Davis. From the available evidence Metcalf seems to have been the more tolerant and indulgent of Burroughs’ writing. When Davis was assigned Burroughs in 1914 the latter was an established star of the Munsey stable of writers. Davis wrote an autobiography c. 1940 that I haven’t been able to obtain but which should have much information on his dealing with ERB. Davis appears to have been much more critical of Burroughs, even bullying him, pushing suggestions on him that the vulnerable writer couldn’t resist. Davis was the one who suggested that Tarzan have a son, something Burroughs always regretted doing. Davis seems to have been of the opinion that ERB used a number of trite situations, situations that have subsequently been amply exploited by the movies. Not having grown up in ERB's milieu and being sufficienctly underread in the various literatures of the times I am unable to say whether or not Burroughs presentation of Barney Custer’s execution by firing squad was trite or not as Davis states. Why Davis should have accepted the grazing of the head by the bullet that has become so commonplace in the movies and rejected the first episode is beyond me. That Davis accepted Barney’s escape through the sewer without a demur when the episode is a blatent plagiarism of Jean Valjean’s escape through the sewer in Les Miserables is beyond me also. Burroughs even duplicate the upturned face as the filth rises about Valjean. ERB does provide the original twist of Barney being completely submerged in the sewage. Gruesome enough. So Davis’ intent seems to have been a contest for control and dominance. 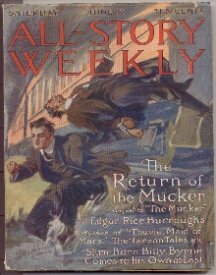 It seems then that there were large variations between the magazine stories and the published books as ERB reinserted deleted passages and changed details back to his original writing. Overall, from the available evidence, I hold an unfavorable opinion of Davis’ interference. 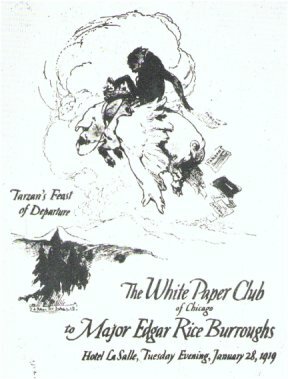 On the home front, while ERB may have thought to find acceptance for his success as a writer and his newfound prosperity he was to be bitterly disappointed as his writing was disparaged and his topics made him a literary clown in his contemporaries' eyes. To my undertanding he has never been accorded the respect that is his due to this day, either in Oak Park or Chicago. The fact is that he was able to please his audience in the pulp fiction genre mightily, not only in 1913-14 but for at least a quarter century until his medium, pulp fiction, began to flounder in the thirties and forties. Having now read so many of his novels four to six times I am beginning now to have a much greater respect for ERB’s writing abilities. The sequels of all three novels under consideration show an extreme focus on exactly what the story is and told with great economy, yet with words so well chosen that the reader learns everything that he has to know. I am especially impressed with the single-minded drive of The Mad King. While obviously desiring acceptance and even importance in Chicago’s society ERB made an effort to be accepted by the newspaper columnists he had so admired from young manhood on. These men were very much admired by ERB. Indeed the columnists occupied a position analogous to the drive time radio commentators of our day. Chicago had some of the best. Burroughs had collections of Eugene Field and George Ade in his library so that it is clear that he was much influenced by them. He does not seem to have cared for Peter Finley Dunne and his Mr. Dooley Irish dialect stories. Now as man he began to contribute to the successors of Field and Ade. Bert Leston Taylor’s column A Line Of Type Or Two in the Chicago Tribune printed some of Burroughs’ verse submitted under his pseudonym, Normal Bean, as well as another column in the Tribune, In The Wake Of The News by Hugh E. Keogh also known as HEK. (source: Porges) Both columns were prestigious so that the acceptance of ERB's verse would indicate that it was high enough quality for the columns. After all it isn’t that easy to get into such columns or even have a letter to the editor published. Burroughs also joined the White Paper Club that sounds like a catchall scribblers club. He was ignored and shunned by the prestigious clubs. A note on cars and then to the books on review. In 1913 he had and sold a Velie. In 1914 he bought and drove a Hudson, while he drove a Mitchell in 1915. The Velie was a low priced model bought second hand so it probably didn’t put ERB out too much. Willard Velie attended Yale at the same time as the Burroughs Boys graduating in 1888. One wonders if the Brothers knew of Velie at Yale. Perhaps such a knowledge may have influenced Burroughs choice or perhaps not. The choice of the Hudson was undoubtedly influenced by the fact that ERB's hero, L. Frank Baum, who ERB almost certainly visited in 1913, drove one. If there is a possible story behind the Mitchell I haven’t learned it as yet. Also it should be noted that the movie industry did not affect Baum's decision to move to Hollywood. Cecil B. Demille and Jesse Lasky didn’t step off the train in LA until 1914 when they introduced Hollywood to the movies. So now ERB began to organize his life around his future rather than his past. The first burst of writing in which he released his pent up emotions was now spent. On the return to Chicago his writing becomes a vocation in which he had to turn out stories every year for the pulps so that he became a professional writer rather than a quasi-amateur. Tarzan Of The Apes was published in May upon his return but it would seem to disappointing sales. It was even difficult for McClurts to get the repring firm of A.L. Burt to take it however it did well for Burt although apparently not in the spectacular numbers so often reported. Nevertheless money began to come in from that source. Burroughs’ writing would also be influenced by the political situation presented by the Wobblies or I.W.W. as well as the outbreak of the Great War in August. That conflict became the subject of the sequel to The Mad King that was written after the war began. The tone of the three sequels then changed from the first halves, becoming less personal in their presentation but still concerned with ERB’s relationship with Emma. 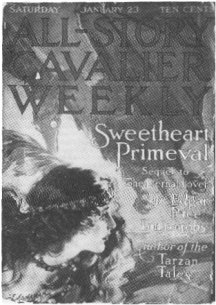 The opening sequence of The Cave Girl-The Mad King-The Eternal Lover was changed to The Cave Man-Sweethearts Primeval (Eternal Lover)-and Barney Custer Of Beatrice (Mad King). Barney Custer of Beatrice seems to display some first hand knowledge of Bert Weston’s business so it is possible that ERB and family visited Weston and Beatrice on the way back from California. In the only letter in the Weston correspondence near the 1914 date, that of June 14, ERB does not allude to any such visit which may or may not mean anything. The Cave Man then was written first of the sequels as was The Cave Girl of the original stories. There are very significant elements to the story. ERB would later use the Nadara as the White Goddess in Tarzan And The Leopard Men. That in turn links Nadara to La and thence to Florence. In this story Nadara has been captured by some aborigines and made their goddess as will be Kali Bwana. Just as Nadara was wearing the Panther pelt so Kali Bwana would be associated with the Leopard as goddess of the Leopard Men. So both women are invested with ERB’s symbol of female sexuality. Just as the long temple here was on a river so would be the Leopard temple. Waldo as Thandar uses the roof as does Tarzan. ERB thus duplicates the story. As Florence entered his life he began to associate her with this early dream of Nadara as well as her successor, La. Signficantly La makes her last appearance in 1930s Tarzan The Invincible transformed to reappear immediately as Kali Bwana of Leopard Men. That would indicate that by 1930 ERB had decided to leave Emma for Florence. Another interesting twist is the similarity of Nadara and the temple to those of Trader Horn. We know that Trader Horn read Burroughs so it is probable that he somehow picked up a copy of the magazine version of Cave Man gestating the story for a decade or so when it came out of his head in 1927. Thus the close association of Burroughs and Horn before and after the publication of the latter’s story. Keeps getting more and more interesting, doesn’t it? A second major issue seems to be ERB trying to reconcile himself and his parents. The second half of the Cave Man is very concerned with portraying Thandar/ERB’s father as a fine old man in contrast to the crazy deaf mute of Lad And The Lion. In this story the father figure is sympathetic while the mother figure is more harsh. She does become reconciled to Nadara in the end when she learns the girl is a French Princess. French again. One wonders if ERB’s mother was opposed to his marrying Emma. Nadara herself who waffles between a representation of Emma/Jane and La in the Cave Girl begins Cave Man as more Emma but becomes more like La/Kali Bwana as the story progresses ending strongly as the latter which would indicate that ERB already preferred his dream Golden Girl to Emma. He finally settled for the rather commonplace Florence as his version of the Wild Thing. The story opens with the usual adventures. Getting Nadar back to her people it is necessary to kill King Big Fist to keep her. Thus we have a series of male images that reflect ERB’s conflict with Frank Martin. Big Fist dead the people appoint Tandar/Waldo as their king. Thandar is in the process of converting the tribe to American Democracy when the earth quake strikes. In addition to head bashing one is astonished at the role earthquakes play in these early stories along with memory loss. In this one Thandar/Waldo is creating a new society somewhat in imitation of the bizarre improvements Jules Verne made to his Mysterious Island when the earthquake strikes ending Thandar’s experiment. The earthquake separates him from Nadara who is then pursued by another neanderthal type; perhaps this is a varation on the theme of ERB’s ccontest with marank Martin for Emma’s hand. In a bizarre episode Thandar puts to sea in a bobbing strange little boat finally falling in with Pirates. From then on the story resembles Pirate Blood. Pirate Blood appeared at the same time as his relationship with Florence developed so the two are proable related to his Anima fantasies. All comes out right in the end as the Pirates restore the belongings of Waldo’s father and mother whose yacht they had captured. Thandar rescues Nadara, all are reunited and Thandar/Waldo and Nadara are able to consummate their natural union with the marriage rites of civilization. An odd little story overall. ERB next turned to the sequel of The Eternal Lover, Sweethearts Primeval. I just like this story. Nu and Victoria return to the Niocene. ERB missed some opportunities here. While Nu left the Niocene to go to the present Nat-ul never did. So when Victoria made her first trip to the Niocene both she and Nat-Ul should have been there. It would have been well if ERB had explained how their two being meshed after the munerous rebirths of Nat-Ul that produced Victoria. In this story Nat-Ul who is a variation of La, and Nu become separated. The story is their attempt to reunite. Once again a character who may represent Frank Martin attempts to abduct Nat-Ul but she escapes him to fall into the clutches of another cave man only to escape finding her way to a small island. The imagery is quite wonderful. Burroughs at his best. The scenery is quite reminiscent of Pellucidar with its coasts and islands. The pirate theme is also prominent in the Pellucidar stories of this time.  Nat-Ul manages to be abducted a number of times escaping each time. Nu is hampered in his search for Nat-Ul by the appearance of a woman named Gron the wife of Tur of the Boat People. She attches herself to Num who has a difficult time getting rid of her. In the end Nu goes off in seach of the tiger OO this time dying while Victoria/Nat-Ul returns to the present leaving a hole in Space and Time. In the end we learn that the whole story of Nu took place in the three mintues Victoria was unconcious. Burroughs then turned to the sequel of The Mad King. The reversal in sequence of The Mad King and The Eternal Lover was necessitated by the fact that after the first part of The Mad King Barney had gone to Africa so that it was now necessary to get him back to Lutha. 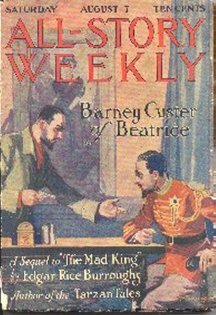 Thus The Mad King and The Eternal Lover are actually one novel of the History of Barney Custer. The two books could be combined and titled something like The Adventures Of Barney Custer in Lutha and Africa. The proper way to read the two books then is Part I of The Mad King, both parts of The Eternal Lover and then the sequel to The Mad King. After losing Emma in Mad King Part I, Barney goes to Africa to ‘forget’ along with Butzow. Leaving Africa we next find him and Butzow in Beatrice, Nebraska visiting Bert and Margaret and their grain mill. If Peter of Bletz had lost rack of Barney in Africa he relocates him in Beatrice (I am informed that Beatrice if pronounced Be-at-trice). After a failed murder attempt by Peter’s henchman Maenck Barney and Butzow return to Lutha. As the story was written after the beginning of the Great War Austria is now attempting to annex Lutha. Apparently ERB was opposed to Austria as he sides with the Serbs. Having been unable to forget Emma in Africa Barney now attempts to win her hand from King Leopold. Barney and Leopold are yet another variation on The Prince And The Pauper then. Barney is captured trying to enter Lutha and put before a firing squad. Miraculously escaping death he escapes the Austrians by a direct borrowing of Jean Valjean’s escape through the sewers of Paris. He is temporarily reunited with Emma but then captured by Maenck. Taken to Leopold he is sentenced to death but contrives to escape by exchanging identities with Leopold. In the guise of Leopold Barney manages to save Lutha from the Austrians. He dressed in Royal and Leopold dressed in rages the two are impossible to tell apart which replicates Twain's story. Barney is more seriously injured than Leopold so more vulnerable and also stupidly trusting. It should be clear that Barney and Leopold are doppelgangers of ERB. The crux of the problme here is the struggle for Emma. She had been promised in marriage to Leopold so that she is unwilling to disengage fromt he agreement without Leopold’s consent. ERB writes this remarkable passage about his tow identities, the one the loser of yesteryear, Leopold, and the other the success of his present, Barney. “Then exchange clothing with me at once,” cried the king, half rising from his cot. One of the trifling details is the release of Emma from her obligation to Leopold. Barney extorts the letter releasing the king placing it under his pillow. Exhausted from his wound he then falls asleep. Not so tired Leopold waits until Barney is asleep than recovers his clothes takes back the letter and leaves Barney to his fate. Up to this point in 1913-14's output ERB has been struggling to make amends with for his dismal performance in the first thirteen yers of marriage and regain her confidence. Thus Leopold represents the old ERB and Barney the new. As Emma has been married to ERB and is familiar with his loser persona it is difficult for her to transit from Leopold to Barney in her affections. As they are so similar in appearance she had difficulty telling them apart. This has been ERB;s dilemma for the last year and a half, convincing Emma that he is trustworthy and will continue to be a good provider. ERB has confidence in his ability to continue his writing and finanical success but his future was not so clear to Emma as he continued his wastrel ways. As she could not share his optimism she continued to be wary refusing to accord him the trust and actually the respect he desired. Leopold in possession of the letter identifying him as Barney races to Lustadt presumably with the intent to present Emma with the letter identifying him as Barney, the man she really wants, the marrying her quickly under the false pretense thus foiling Barney. His own plan is foiled when upon arriving at the castle in Lustadt he is shot dead by Maenck who mistakes him for Barney. Barney then shows up claiming the hand of Emma. Thus with the line: God chose for out ERB unites the stories of Little Lord Fauntleroy and The Prince And The Pauper. The Little Prince of ERB’s early years returns to his God appointed place. He and Emma are united. One believes that the story and its ending was intended for Emma to observe and heed. Apparently she didn’t because in the next Tarzan story, Jewels Of Opar of 1915, Tarzan and La flirt again. Anyway The Mad King sequel rounds out the stories of 1913 bringing Burroughs’ springtime to an end. The tragedy is that Emma couldn’t foresee that ERB had tapped into the Mother Lode. No matter how improvident ERB would continute to be, the money would always be there to continue their new life style. Perhaps if she had surrendered to fate and made ERB her king in fact both she and La would have been united in one figure. It seems that the Cave Girl, The Eternal Lover and The Mad King explored ERB’s relationship with Emma from the beginning to the point that ERB was minded to replace her with an ideal woman. The notion would develop in his mind until in 1927 he actually did so. The three sequels ended the quest of his Springtime. His youthful enthusiasm was exhausted. From this point on he would compose more formal novels searching for story lines. Personally I find his post 1914 to 1920 work some of his best. The two sequels to The Mucker yet to come are outstanding. Female problems continued to dominate his work. Then in 1921 he read a work on male-female relations by E.M. Hull that had a profound effect on him. . . that was the novel of The Sheik. I would like to do a review of that next before I return to the Tarzan series.